This Birchleigh resident just wants clean drinking water. A Birchleigh, Kempton Park, resident says she will quench her thirst with anything but tap water after she found worms in it, Kempton Express reports. And yes, the little creatures were alive. “First, I thought this can’t be, so I just ignored it,” explains Ina Cloete, 63. But after one week and after finding the third bug, and even small pieces of toilet paper in her tap water, she realised something was very wrong. Cloete caught two of these little worms in small glass bottles to show Kempton Express. The creatures swim to the top when she turns the bottle around. 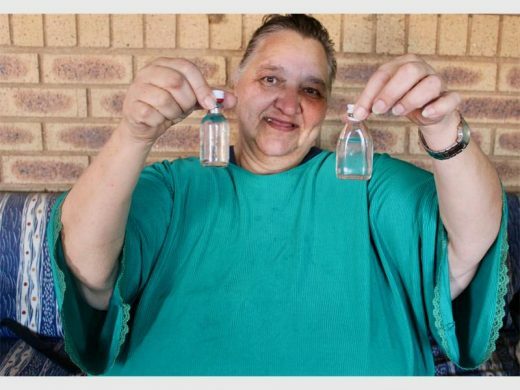 Birchleigh resident Ina Cloete (63) shows the worms she found in her tap water. “No one would want to drink this,” Cloete says. She hasn’t touched a glass of water since. According to ward councillor Gideon van Zyl, Cloete did speak to him about the issue. Therefore, other Birchleigh residents don’t have to worry too much that they’ll find creepy-crawlies in their water. The metro has been approached for comment, but failed to comment at the time of publication.